The submission for paper is now closed. Halal industry is among the fastest growing global business. Halal food has attracted the interest of non-muslim consumers due to its wholesome, hygienic and contamination-free principles in food production. The current halal industry is not only restricted to food but it also includes cosmetic, pharmaceuticals and other consumer products as well as other services such as hospitality and logistics. 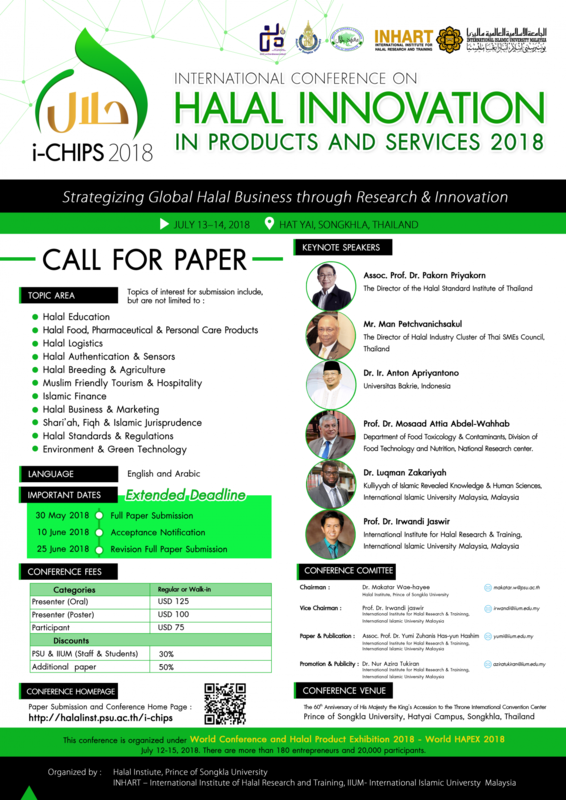 In response to the rapidly growing Halal industry development, the International Conference on Halal Innovation in Products and Services 2018 (i-CHIPS 2018) seeks to bring together studies and researches related to the topic as a guide to increase awareness of Muslims in particular and humanity in general. The main goal of i-CHIPS is to unite leading academics, researchers and practitioners, sharing worldwide ideas as well as the recent developments on Halal related technology and innovation. Special sessions, poster and oral presentations will be included in the conference program. We invite you to submit a research paper related to one of the themes of the conference. We would appreciate if you can kindly inform your colleagues and encourage them to submit their papers as well. Copyright © i-CHIPS 2018 All right reserved.